The year 1837 saw the introduction of the Seated Liberty Half Dime, and a phase-out of the Capped Bust type. The Seated Liberty theme on the Half Dime lasted until 1873, and was also present on the U.S. dime, quarter, half dollar, and silver dollar. After 1873, no one would ever see another new U.S. Half Dime. There were several varieties of the Seated Liberty Half Dime, involving drapery, stars, arrows (corresponding to weight changes), and legend location. Throughout all the changes, Liberty herself remained seated in much the same position. 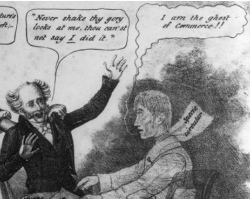 Above is a satire on the Panic of 1837, criticizing President Martin Van Buren's continued "Specie Circular" policy of his predecessor, Andrew Jackson, which required the US government to accept payment for federal lands only in gold and silver coinage. This move led to the failure of more than 800 banks and a severe economic recession. The satire shows the president haunted by the ghost of Commerce, seated at the right. Image courtesy of Library of Congress. The most valuable Seated Liberty Half Dime is the 1870-S. Only one lone specimen is known to exist, and could possibly sell for millions of dollars, if put on the auction block. Its existence remained unknown until 1978, when it was found mixed in with a small hoard of common date coinage. The 1870-S Seated Liberty Half Dime is a fabled numismatic discovery of immense proportions. In spite of nearly 40 years of production, there are not many key dates to chase after. Some of the half dimes from the Philadelphia Mint in the 1860's are quite rare, but have advanced only sporadically in value over time. Prices may stagnate for many years, then suddenly explode in value, only to get stuck once again. 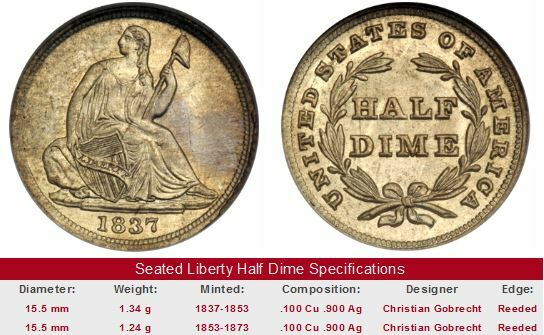 Seated Liberty Half Dimes dates from the 1860's (Philadelphia Mint only -- SF Mint are common) are offered for sale below, through eBay coin auctions (its surprising how many people use the phrase "eBay antique coins for sale" while searching the Net). The left hand side of each "Sales Box" is value trend data over a very long period of time for an 1865 Seated Liberty Half Dime in G-4 condition. The percent annual increase is computed for comparative purposes. The coin pictured for sale in the right hand side is not necessarily an 1865, as is represented in the value trend analysis on left hand side, but is dated in the 1863-1867 range.